Hello Games just announced The Abyss for No Man’s Sky. No Man’s Sky NEXT launched just a couple of months ago. We have been absolutely overwhelmed by the positive response. We are excited to be on this journey with you. Over the months since release we have been adding new free content, community missions and improvements to No Man’s Sky every week. From small features like allowing players to customise body shape, to large gameplay additions like the Pilgrim motorbike, and companion features such as addition of discovery leaderboards to the Galactic Atlas, allowing the community to track progress between factions. We have enjoyed posting weekly development updates and highlighting some of what players are up to in our game. It’s so gratifying, and often quite touching, to see how No Man’s Sky and the community have grown and evolved. We’ve been listening intently, and are hard at work on fixes and improvements. We wanted to share a little news from behind the scenes. Whilst most of the team have been busy on weekly updates, a handful have been working on something else, our first titled update since NEXT. A new free update is releasing next week for all players. 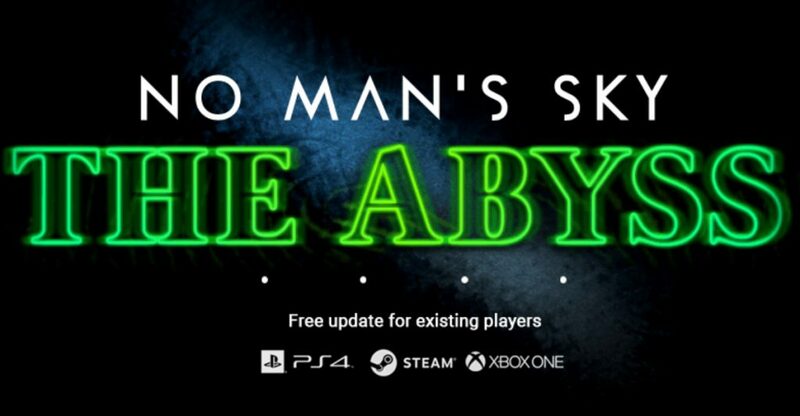 We’ve called it The Abyss, because it focuses on some of the eerier elements of No Man’s Sky, in keeping with the theme of this season. This is another small step on a longer journey for us. Thank you for joining us. No Man’s Sky is available on PS4, Xbox One, and PC platforms. Read our review here.